The Arts and Crafts Movement in Yorkshire: A Handbook is a beautifully produced book with 424 pages and 535 photographs. 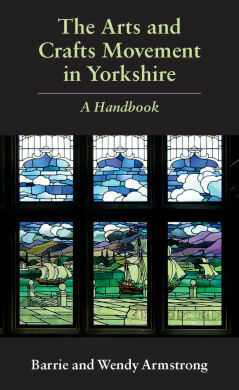 It has an introductory essay reviewing the development of the Movement in the three Ridings of Yorkshire followed by a gazetteer which describes some 800 places where visitors can see examples of the architecture, stained glass, metalwork, sculpture, ceramics and other decorative arts inspired by the Arts and Crafts Movement. The entries also give practical information for visitors with map references, brief directions, details of opening hours and contact telephone numbers. A ‘Who’s Who’ section provides information about more than 400 practitioners whose work appears in the gazetteer. In addition to recording the work of architects, artists, craftsmen and designers with national reputations, the authors have sought out and promoted the work of provincial men and women who adopted the ethos of the Arts and Crafts Movement. This well indexed book contains an extensive bibliography and is an excellent guide and companion to both the arm-chair explorer and the out-and-about Arts and Crafts tourist. It will also bring new discoveries to the attention of the specialist reader. Price: UK £25, US $47, EU €35, Non-EU/Non-US £28 (incl. p+p).